ICC has adopted FEMA criteria for the design and construction of a safe room that provides near-absolute protection for occupants from wind and wind-borne debris. With SafeSpace 500, safe rooms and storm shelters can be constructed to FEMA 361 and ICC 500 Standards without sacrificing natural light and multi-purpose use. Utilizing McKeon Door’s wide span engineering capabilities, this new technology can protect multiple openings and is available up to 16 feet wide so won’t restrict the size of the openings for doors and windows. An operational wind load of 110 mph combined with the durability of a McKeon wide span opening protective door assembly makes this product an ideal solution in any environment. Tested and certified for door assemblies up to 30 feet wide with a wind load introduced and maintained over the duration of a complete opening and closing cycle. Ensured operation during sustained wind loads offers the end user the flexibility to use these door assemblies in virtually any structure in any application. Guarantee consistent work schedules and protect building contents without compromising occupant safety. A vertical coiling fire and smoke rated door system that incorporates either one or two deployable complying egress swing doors. Flush mounted in an adjacent wall, these complying egress swing doors deploy and lock into position at the command of an alarm condition. Once in place the integral egress doors and frames serve as side guides to accommodate a 3-hour roll-down door assembly that descends at a governed rate. Within seconds a 3-hour opening protective with single or dual egress swing doors stands ready to fight fire and smoke. The McKeon Auto-Set® Model FSFD is recommended in situations where fire and smoke protection is required but emergency egress is not an issue. The vertically acting fire door is UL classified for up to four hours in both masonry and dry wall applications. The FSFD-IS is designed for interior or exterior applications where fire protection is necessary and climate and temperature control are also critical. Available with an R value up to 9.3, the highest in the industry. The Auto-Set® Model FSFD-TR is designed for use in areas where a Temperature Rise rating in addition to standard fire ratings is required. Available with up to a 450° F over 30 minute Temperature Rise rating when required, it meets building code requirements for fire doors used in exit enclosures and exit passageways of non-sprinklered buildings. The automatic resetting Auto-Set® Counter Fire and Smoke Rated Model CFS shutter can be designed to accommodate almost any opening variation up to 28 feet in width and 12 feet in height. Unlike conventional counter shutters the Auto-Set® Model CFS is easily tested and reset by on-site building personnel. Safescape® S7000 Series fire door systems are available in both manual or motor operated designs and with or without swing type egress doors. S7000 Series doors are side acting therefore ideal for openings in fire walls where headroom is limited. The side activated design enables these fire doors to navigate around tight curves and contoured openings. The automatic resetting S4000 is a side coiling fire and smoke rated door. The S4000’s side activated design makes this product ideal for openings in rated walls where headroom is limited and enables the door to navigate around tight curves and contoured openings. The Safescape® AC8000 Series fire door systems are available in either manual or motor operated designs and can be provided with or without swinging egress doors. The units are made up of either 7-inch or 14-inch panels requiring a 9-inch or a 15 1/2-inch pocket profile, respectively. The automatic closing H200 Series horizontal shutters prevent the migration of heat, smoke or hot/toxic gases by creating vertical compartments thereby separating the vertical spaces from one another. Horizontal shutters reduce construction costs. Smoke evacuation systems can become unnecessary and one horizontal fire shutter can be used in lieu of numerous conventional fire barriers on multiple floors. The D200 is an opening protective made of a flexible fire-rated fabric that is US laboratory tested and approved for unlimited widths. A first in the industry, the D200 carries a UL 10B and UL 10C rating for 20 minutes, UL 10D for up to 3 hours, and UL 1784 for smoke and draft. FireFighter D200 is approved for use in multiple applications – whenever the 20-minute UL 10B or UL 10C rating is required for a fire door or shutter used to provide protection for an opening of any size in a rated wall. The D200E offers a patented and burn-tested egress feature that complies with exiting requirements of the building codes. The FireFighter D200E Series is the only protective curtain assembly on the market with a 20-minute UL 10B and 10C rating, up to 3-hour UL 10D rating, UL 1784 smoke and draft rating and integral conforming swing egress door(s). “The First Responder” is truly a first – going beyond where others leave off! The McKeon SmokeFighter D100 is manufactured from protective curtain assembly material that has been tested and certified under UL 10B, 10C, 10D and UL 1784; and approved to span unlimited widths and heights up to 24 feet. The test criteria included side guides, however, the test parameters for draft curtains do not require any of the above certifications except to resist the passage of smoke. Thus, the McKeon D100 exceeds the fire and life safety requirements for draft curtains in the building code. This technology provides a compliant solution where the model building codes prescribe smoke-only separation and egress is not required. The assembly is fixed in place with side guides and bottom bars so smoke is handily contained when the building goes into an alarm condition. 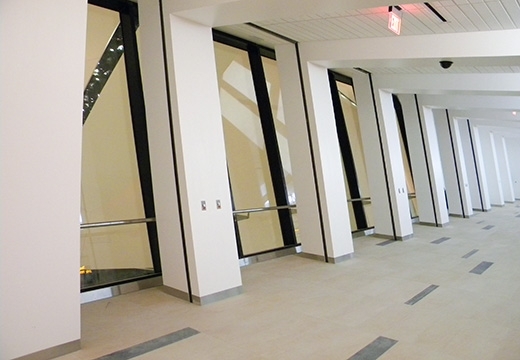 McKeon Door Company offers a smoke and draft listed curtain assembly at the point of access to an elevator car with a patented egress feature that complies with the exiting requirements of the building codes. The D150E incorporates a vision panel and has been tested without an artificial bottom seal. PF3000 service doors are custom designed to accommodate any opening size. These doors are available in prime painted galvanized steel, aluminum, stainless steel or can be powder coat finished to any color requirement. Service doors require less headroom and side room than product alternatives such as swinging or sliding type doors. They also offer more security and are highly durable and easy to repair and maintain. SD3000 service doors are custom designed to accommodate any opening size. These doors are available in prime painted galvanized steel, aluminum, stainless steel or can be powder coat finished to any color requirement. Service doors require less headroom and side room than product alternatives such as swinging or sliding type doors. They also offer more security and are highly durable and easy to repair and maintain. McKeon coiling counter shutters are available up to 28' wide by 12 high. The CS3000 is designed and manufactured to accommodate both interior and exterior applications. They provide maximum security and require very little head room and side room. These units are available in either prime painted galvanized steel, stainless steel or they can be powder coat finished to any desired color. All coiling counter shutters are available in manual push-up, manual hand crank or motor operated operation. ClimateGuard™ IS3000 insulated service doors are filled with thick foamed-in-place polyurethane which permanently bonds to both the interior and exterior slats panels of the curtain providing an R value of 6.25, calculated according to ASHRAE formula. Insulated service doors are available in prime painted galvanized steel, aluminum, stainless steel or can be powder coat finished to any color requirement. They are the ideal solution when energy conservation and protection against the elements is of primary consideration. When necessary these doors can be designed as self-opening assemblies to allow for egress. The HS100 and HSL150 are horizontal coiling service doors that are designed to close off openings in horizontal and inclined planes. Horizontal coiling service doors can be designed in sizes up to 20 feet in width and 100 feet in length. These units are primarily motor operated systems that are designed and engineered for daily operation. They are available in aluminum with various anodized finishes; in stainless steel type 304 or type 316 with number 4 finish; and in galvanized steel with either a prime paint finish or powder coated finish of color as selected. Safescape Models G1000 and G1500 are vertical coiling self-opening security grilles with emergency egress. These units are intended for use where both security and egress are issues. In the event of an emergency, power failure, activation of a facility's fire alarm system or smoke detection system, the security grilles move to the fully open position. This is accomplished without the use of electricity or battery back up systems. In the emergency mode these units provide the required clear egress path. In the non-emergency mode, these units provide required security. Model G1500, in the fully closed position, allows for two means of egress. For convenience, the complying egress swing door can be used in lieu of raising the overhead coiling assembly. To allow higher occupant loads to access the opening without activating the grille, dual complying egress swing doors are available. Safescape Models G4000 and G4500 are side coiling self-opening security grilles with emergency egress. These units are intended for use where both security and egress are issues. In the event of an emergency, power failure, activation of a facility's fire alarm system or smoke detection system, the security grilles move to the fully open position. This is accomplished without the use of electricity or battery back up systems. In the emergency mode these units provide the required clear egress path. In the non-emergency mode, these units provide required security. For higher occupancy loads the G4500, with integral swinging egress doors, is recommended. SG3000 Series security grilles provide a more aesthetically pleasing solution to securing openings than conventional accordion folding or sliding gates. These vertical coiling units are made of vertical links and horizontal rods – either stainless steel, steel or aluminum. They are available in motor, hand crank, hand chain and push up operated designs. A variety of finishes and patterns is available. SG3000 grilles require much less head room and side room than other options providing design professionals with a great deal of flexibility. When head room is a severe problem, the motor drives can be remotely mounted thus reducing the head room requirements by several inches. SC3000 Series security doors and grilles are side activated closures constructed of solid curtain slats, perforated curtain slats or of a security open type grille curtain. These units are opened and closed with a positive action system that is housed within the coil box assembly. Side coiling closures enable the designer to close off areas where head room and side room restrictions exist and where conventional coiling overhead doors and grilles do not solve the problem. These closures are capable of navigating around a radius as small as 12 inches. All SC3000 side coiling closures are available with an optional floor track.